Capt. 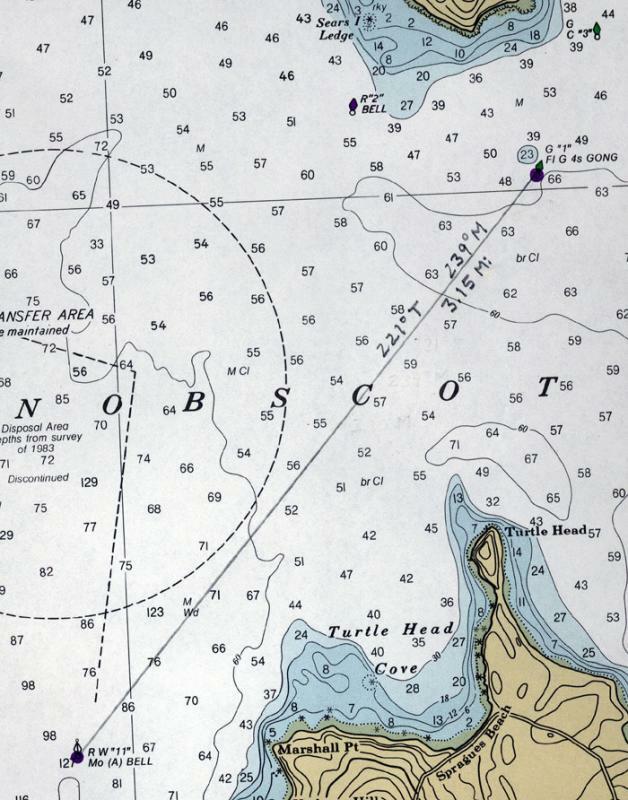 Phineas Alexander Griffin of Searsport wrote on this chart of the North Pacific a note identifying the spot where his daughter Anita was born. Captain Griffin's ship was the 1869 Belfast launched and owned Leonora, which was sold to Italy about 1885. The museum has another copy of this chart, published two years later, on which Capt. Griffin again made a mark showing where his daughter was born. Here is a view of the harbor of Rio de Janeiro, Brazil. as shown in 1873 on a British Admiralty chart. 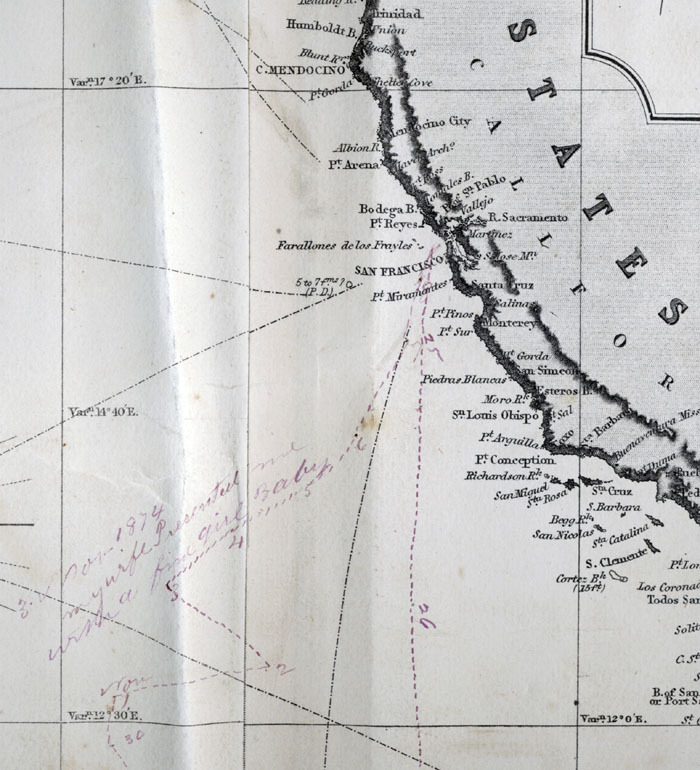 The chart includes engravings of views of entering the harbor, showing the famous mountain called Sugarloaf. Map in book showing best sailing routes taken to go to the Far East, during the NE Monsoon season, from October to April. 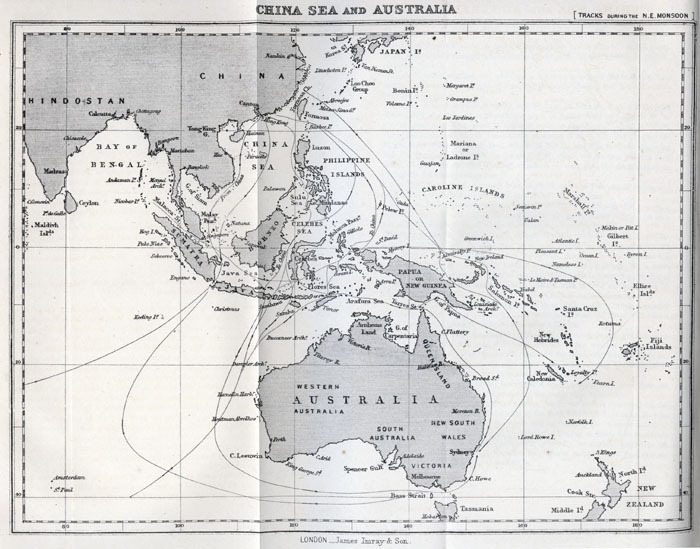 From The Seaman's Guide to the Navigation of the Indian Ocean and China Sea by W.H. Rosser and J.F. Imray, 1867. 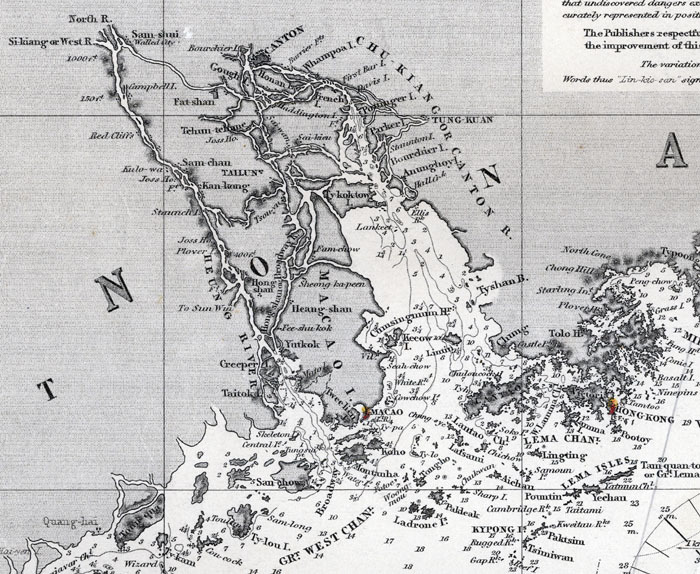 Detail of East India Archipelago, Western Route to China, Chart No. 5, showing Macao, the Canton River, and Hong Kong. Whampoa Reach was as high as trading vessels were allowed to sail on the Canton River. Published by James Imray & Son, 1876. 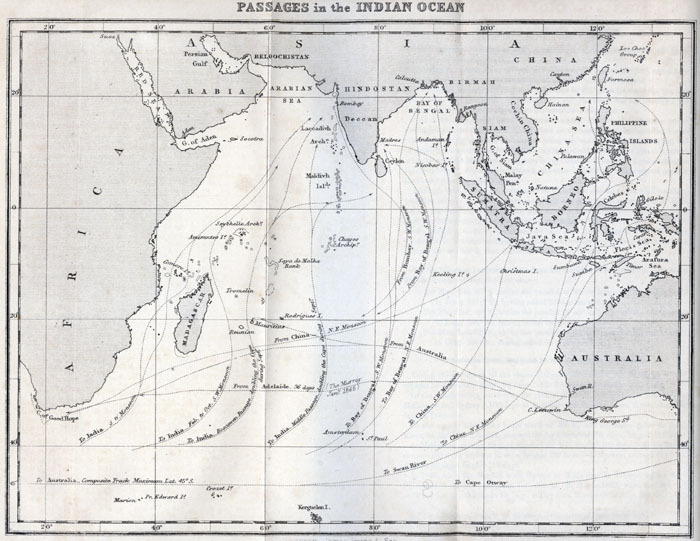 Map in book showing the preferred sailing routes to go to India and the Far East, taking advantage of prevailing and trade winds and ocean currents. The most direct way was not always the fastest. 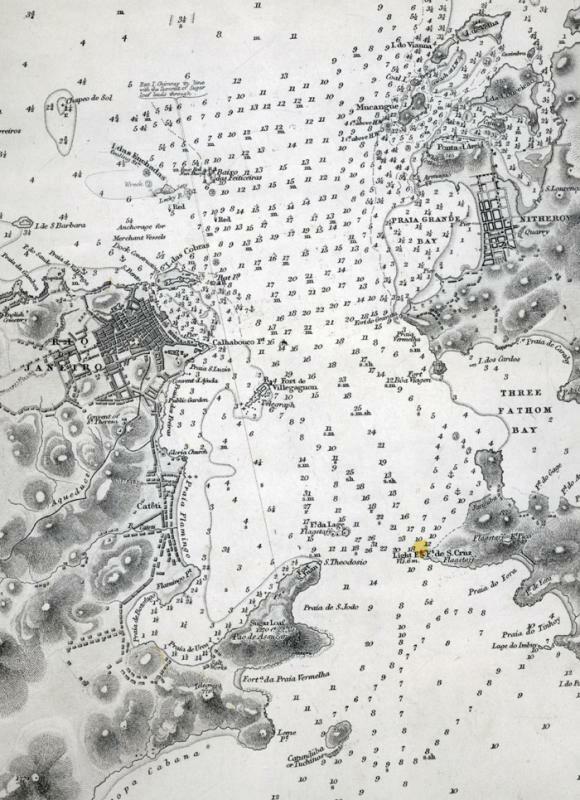 An etching of the Carter Shipyard in Belfast on the 1855 Map of the City of Belfast, Waldo County, Maine. 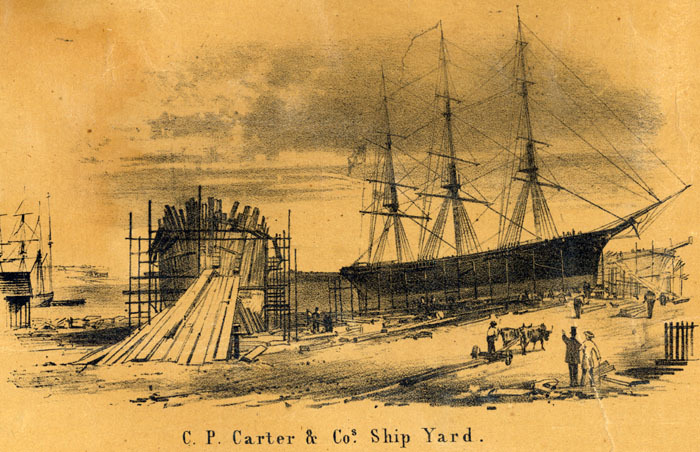 A ship is ready for launch, while the one in the foreground has been framed up and is being planked. The ramp at the bow lets wood be carried in. J. 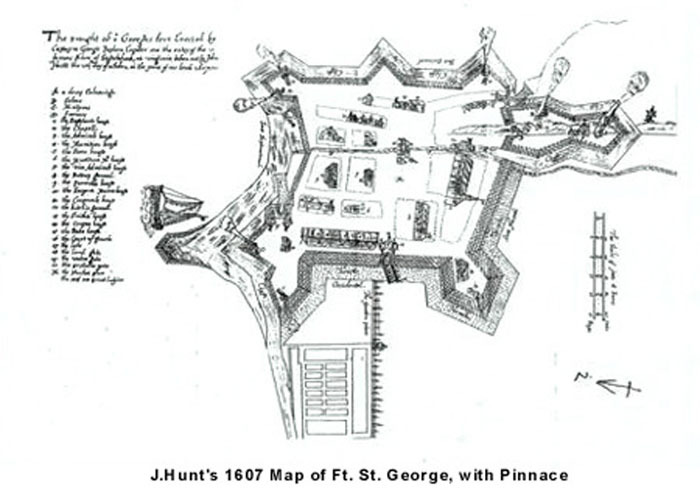 Hunt's 1607 map of Ft. St. George in Popham, Maine, showed a sketch of a pinnace, thought to be the Virginia, built at the Popham colony in 1607-1608. How accurate an image this is, is hard to determine, but it does correspond with what other sources call a pinnace. Virginia was the first European style vessel to be built in North America. After sailing some of the colonists home in 1608, she made at least two more transatlantic voyages to Jamestown. Virginia lies just to the left of the fort in the drawing, turned 90 degrees. 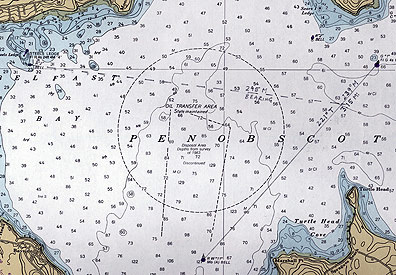 After sailing along the route, a compass bearing of 295 degrees magnetic to the red bell buoy off Belfast Harbor is taken. Plotting it shows that the distance back to the green gong is about .65 nautical miles. If time of departure is recorded as well as the time of the bearing, speed can be calculated. This single line of position produces a running fix. If another bearing were taken at the same time as the 295 bearing, an accurate position could be established. The course line is drawn on the chart. Above it is written both the magnetic and true courses while below it is the distance of the route. Take a pair of dividers and set one tip on the green gong buoy and the other on the red and white bell buoy. 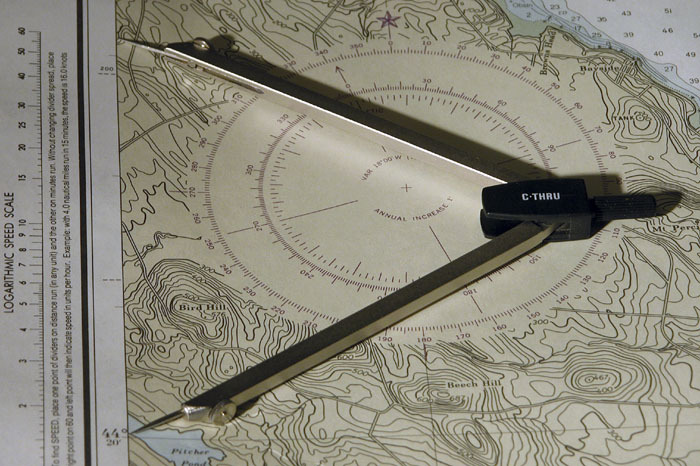 Then bring the dividers to the side of the chart near the course and measure the distance of that leg of the route. One minute of arc of latitude equals one nautical mile.